Dow fell 53, decliners over advancers 3-2 & NAZ went down 9. The MLP index went down a fraction to 310 & the REIT index was up fractionally to the 362s. Junk bond funds inched higher & Treasuries were steady. Oil dropped under 45 & gold fell back to 1311. US. 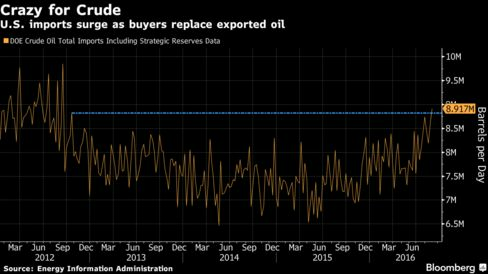 last week imported 8.92M barrels a day of crude, the largest amount in almost four years, according to preliminary data from the Energy Information Administration. Minneapolis Fed pres Neel Kashkari said he is looking for core inflation to tick up before the central bank raises interest rates. "I'm very interested to see core inflation," Kashkari said. "We haven't seen it yet. That's what I'm looking for." He is not a voting member of the Fed's policy committee this year. A measure of homes under contract for sale rose in Jul, a sign of steady demand amid low interest rates & rising employment. The National Association of Realtors' pending home sales index, which tracks contract signings for purchases of previously owned homes, increased a seasonally adjusted 1.3% to 111.3 in Jul. Sales then typically close within a month or 2 of signings. The forecast expected a 0.7% rise. The index had registered at a downwardly revised 109.9 in Jun after reaching a post-housing bust peak of 115.0 in Apr & now sits at the 2nd-highest level of 2016. The Jul reading was 1.4% above its year-ago level. "More home shoppers having success is good news for the housing market heading into the fall, but buyers still have few choices and little time before deciding to make an offer on a home available for sale," said Lawrence Yun, NAR's chief economist. Pending sales were up across most of the country but fell in the Midwest. The housing market has been a relative bright spot in the economy in recent years, though it has shown signs of cooling amid high prices & tight inventories. Last week, the Realtors group reported that the pace of existing-home sales fell 3.2% last month from Jun to a seasonally adjusted annual rate of 5.39M. "There's little doubt there'd be more sales activity right now if there were more affordable listings on the market," the NAR said. Low mortgage rates & continued job creation are luring more would-be buyers into the market. Gold futures settled lower, helping push the precious metal to its first monthly decline since May, underscoring a broad slide in the metals complex in Aug. Gold for Dec fell $5.10 (0.4%) to settle at $1311 an ounce, for a 3.4% decline in the month of Aug. Silver's most-active contract dropped 8.1%. Similarly, prices for copper, platinum & palladium all declined over Aug.
Aug was an uneventful month for the stock market, as usual. Dow was up a little in the month due to a strong performance in the first week. However oil had a very volatile month & gold pulled back. Next week, traders will return, bringing more excitement to the markets. Dow dropped 40, decliners over advancers 4-3 & NAZ fell 10. The MLP index lost 2+ to the 308s & the REIT index was fractionally lower in the 361s. Junk bond funds were little changed & Treasuries crawled higher. Oil & gold were each lower again. Euro-area inflation failed to accelerate in Aug, adding to signs that the area's economic outlook deteriorated ahead of a ECB meeting next week. Consumer prices rose 0.2% in Aug from a year earlier. The estimate was for an increase of 0.3%. 2 months after the UK Brexit vote, the 19-nation economy is beginning to show signs of faltering, suggesting that more stimulus may be warranted. Business & consumer sentiment declined & executives are warning that orders may suffer from political uncertainty. The IMF has already cut its forecast for euro-area growth next year & the ECB will release new projections after its meeting next week. Policy makers have already deployed a raft of unconventional stimulus that includes large-scale asset purchases, negative interest rates & long-term loans that see banks getting paid for extending credit to companies & households. Still, inflation remains far below the ECB goal of just under 2%, a level it hasn't reached since early 2013. The institution predicts price growth will accelerate to 1.6% in 2018. Core inflation slowed to 0.8% from 0.9% a month earlier. German inflation unexpectedly decelerated to 0.3%, while consumer prices extended their decline in Spain. Euro-area unemployment remained unchanged at 10.1%, according to a separate release. The inflation report comes one day after a European Commission survey showed economic confidence declined across most countries & most sectors in a delayed reaction to Britain's decision to leave the EU. 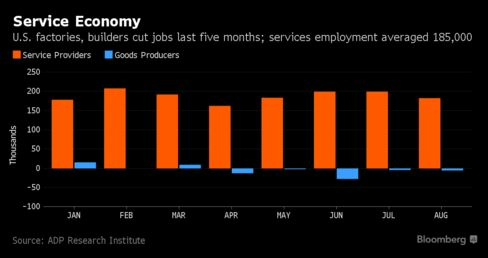 The data may reopen the debate about more stimulus at the ECB's Sep 8 meeting. Companies added workers to US payrolls in Aug in line with projections, contributing to signs of a steady labor market, data from ADP Research Institute. Private payrolls climbed 177K (forecast was 175,K) after a revised 194K gain in Jul (more than initially estimated). Goods-producing industries, which include manufacturers & builders, reduced headcounts by 6K. Service providers’ payrolls rose 183K. Hiring managers are taking on workers to meet sales, evidence of sustained job-market progress that Federal Reserve officials will weigh when they meet in Sep.
“The American job machine continues to hum along,” Mark Zandi, chief economist at Moody’s Analytics said. “Job creation remains strong, with most industries and companies of all sizes adding solidly to their payrolls. The U.S. economy will soon be at full employment.” Moody's produces the figures with ADP. Companies employing 500 or more workers increased staffing by 70K jobs; payrolls rose by 44K at medium-sized businesses (those with 50-499 employees) while small companies' payrolls advanced 63K. The Institute for Supply Management's gauge of factory activity in the Midwest region fell to 51.5 in Aug from 55.8 the month prior. The forecast was for a smaller decline to a reading of 54.0. Readings above 50 point to expansion, while those below indicate contraction. Not much going on today in the slowest week of the year. Stock averages have been trading sideways for most of the summer & that trend should not change until after Labor Day (at the earliest). Oil tried to rally, hoping to top 50, but that effort failed. Gold is sliding lower from the mid 1300s to the low 1300s.